Shimmer's vomiting problem has gotten much worse. I woke up at 5:45 AM on March 24 to hear her puking all over the floor of my room. I got my mom up to help just as Shimmer ambled down the hall to the kitchen, puking every few feet. My mom cleaned up everything she left behind while I supervised Shimmer in the kitchen, trying to keep her out of our family room where it's carpeted. Her vomit changed in color gradually from yellowish brown to whitish/clear to pink. She also used the litter box to defecate, but it was coming out all loose. She became weaker, fighting less against me keeping her restrained and eventually slumping onto the floor. I kept her covered with a towel for warmth while my mom called up an emergency vet. It's hard to watch your cat cry on the floor in between heaves. We took her later that morning over to the emergency veterinarian clinic, where they decided to keep her overnight on activated charcoal, an anti-nausea injection, and an IV for fluids. Her blood test results showed elevated liver chemicals and a decreased white blood cell count, but everything else was normal. She was released the next morning with a liver supplement prescription and a recommendation for further testing. The other day, we took her back to see one of the vets at the Michigan Humane Society for a followup. We were told that the elevated liver chemicals (ALT in particular) were likely due to liver trauma and cell destruction from how hard she was puking, and that she was expected to recover from this. The decreased white blood cell count didn't seem to be a concern though. Shimmer is now supposed to be on a hypoallergenic diet to make it easier on her GI tract (although she refuses to eat it), and she is supposed to get an ultrasound soon to check out her liver and small intestine for issues. If that doesn't turn up anything, she might need surgery for a biopsy. Hopefully we find out the real cause of her problem soon. I recently received a spam email in my inbox, and some aspects of it interested me enough I figured I would write a blog post about it. It's basically the 419 scam you all know and love, but with some minor twists to it that seem new (at least to me). 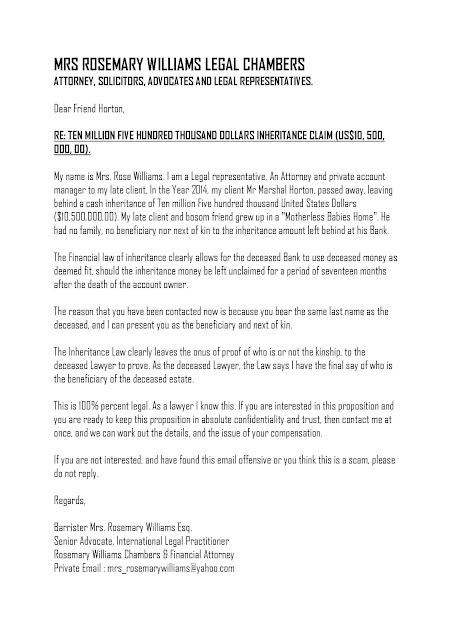 The email claimed to be sent from a Mrs. Rose(mary) Williams, although the actual email address behind it is dondgarciaext123@gmail.com. I was blind carbon-copied on this, presumably to keep it looking like a direct communication and without tipping off any potential victims about the existence of others. The body was a sole JPG image file with no other text; the file is reproduced below for the reference point of my analysis. Let's go over this message bit-by-bit. This post can be thought of as something like a follow-up to my last post when I tried the Soylent Cacao and Nectar flavors (which were pretty good and pretty bad, respectively). Soylent recently announced the availability of new flavors on their official blog. I'm guessing that the "Coffiest" variant of Soylent they've had for a while now, which seems at first glance to be a mixture of Soylent and coffee intended as a breakfast food, must have been doing pretty well. 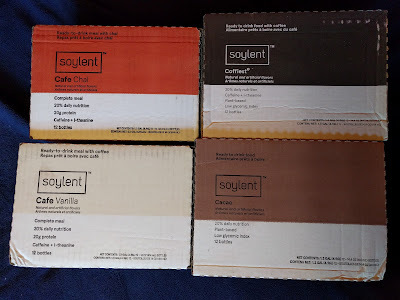 They now have a Soylent Cafe line of drinks, which the aforementioned Coffiest belongs to, as well as their brand-new Soylent Cafe Vanilla and Soylent Cafe Chai flavors. All three flavors are caffeinated, with Coffiest and Vanilla each supposed to have roughly the same caffeine content as a cup of coffee, and Chai on par with a cup of tea. The new flavors also have L-theanine added, which is claimed to somehow help with "jitters" from caffeine. It seems squircles are pretty popular nowadays. Both iOS and Ubuntu make use of this shape, which also appeared in some other places. If you don't feel like following my Wikipedia link, a squircle is defined geometrically by the equation x4+y4=r4. And if you don't feel like parsing that, it's basically a cross between a circle and a square, hence the name "squircle". Rounded rectangles are NOT squircles. Rather, a squircle's "corners" are not mere circular arcs, and the edges are more rounded. Rounded rectangle (left) vs. squircle (right).